It is early autumn. Your fridge and freezer are overflowing with raspberries, black berries and other berries you have collected over the summer. What to do to make room? Make jam! Besides preserving fruits and berries, it is also great fun with some interesting chemistry involved. You can see the result of my first attempt to make jam from black berries I picked during late summer in the image above. What do you need to make jam? You will need equal amounts of fruit and sugar in weight. I will refer to a recipe used for 1 kg of fruit and 1kg of sugar. The task of the sugar is to bind water and draw it away from the fruit. With no water available, no mould will be able to grow on jam which causes the preserving effect. As you can see, it is important to use enough sugar, but too much of it will lead to the formation of sugar crystals. In addition, acidity is needed, so the jam can set properly. Fruits naturally contain some acids, but more will have to be added for certain fruits like berries to reach the perfect pH for jam to set, which is at 2.8 to 3.3. To reach this pH-value, you can either add citric acid or use jam sugar where citric acid is already contained. I chose another method and added the lemon juce pressed from one lemon which naturally contains a lot of acid. What happens after mixing together fruit, sugar and acid? The mixture is first heated and stirred until all the sugar has dissolved and the boiling point is reached. Then continue to boil gently for 15 to 20 minutes. What happens now is that the pectin molecules, which consist of long chains of sugar molecules linked together, react with each other to form a network of long chains. 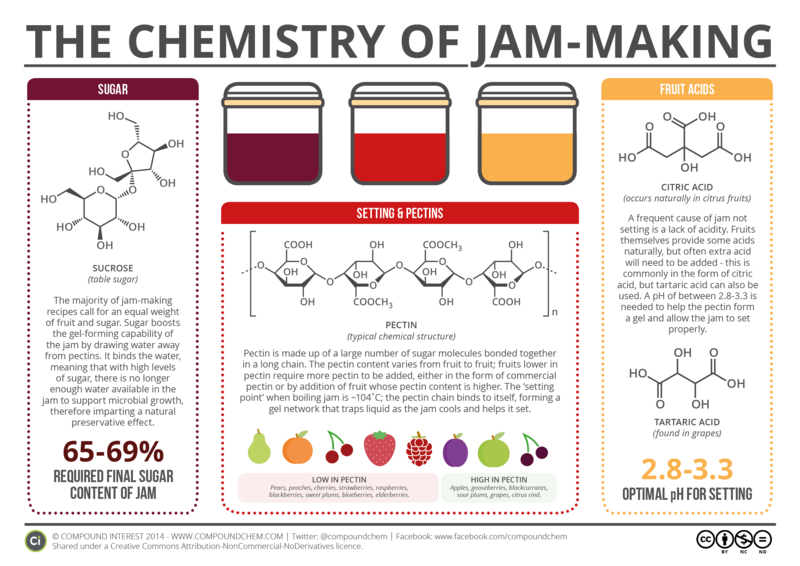 This reaction happens at 104.5 degrees Celsius and it gives jam its gel-like texture. Fruits contain pectin, but in different amounts. For example black berries that I chose to make my jam do not contain enough pectin to form a gel. In this case, jam sugar can be used, which contains pectin additionally to the citric acid. It is also possible to add one fruit that is high in pectin to the jam making process, which could be an apple or a citrus fruit. Instead, I decided to add four table spoons of grated lemon zest, which also contains pectin. In fact, pectin added to jam sugars is made from the peels of citrus fruit. The jam is ready to pour into jars, when enough pectin molecules have reacted to form the gel-network. You can test when this point is reached by taking some of the jam up with a cold spoon and letting it cool. Then observe how the jam moves when you move the spoon around. It should just stick to the spoon and stay in one place, when the pectin network has set sufficiently. Make sure, to wash your glass jars with soap and hot water before using them. You can even heat them in an oven at 160 degrees Celsius for sterilization. To create a vacuum inside the glas jars, put them into a pan with hot water before filling them. Pour the jam into the jars when it is still hot, then screw the lit on and remove them from the hot water bath. As the glass jars cool, the vacuum will slowly come on. This is yet another precaution, to make the jam last as long as possible. Making jam proved to be great fun for the chemist, the food enthsiast and the environmental activist inside me. It is a great way to preserve locally grown berries and fruits for the winter which is much more environmentally friendly than buying berries in winter that have come all the way Chile or New Zealand. It is also better than having jam from a supermarket of which you have no idea where it comes from and under which conditions it has been been made. In addition, I found that opening a glass of my own home-made jam is far more exciting and satisfying. What are Ionic Liquids and what are they good for?